The European Union (Withdrawal) Bill is central to the government’s Brexit plan, repealing the laws that made Britain an EU member and transposing existing EU law into British law. “I aim to bring back the very important Brexit legislation within weeks,” said Andrea Leadsom, leader of the House of Commons, without giving a specific date. May, who has struggled to unite the government and parliament behind her vision of Brexit, has said Britain will leave the European Union’s single market and customs union after it quits the bloc next March. 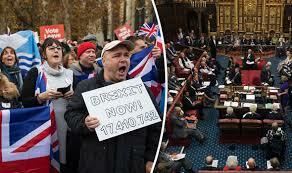 Britain’s upper house of parliament, the House of Lords, has inflicted 15 defeats on the legislation, including on core Brexit issues such as whether Britain should leave the EU’s single market and customs union. The government will seek to overturn these amendments when the legislation returns to the lower House of Commons. But there are concerns that the government may be defeated by pro-European rebels in May’s Conservative Party on whether Britain should leave the customs union, that could force her into a damaging policy U-turn.